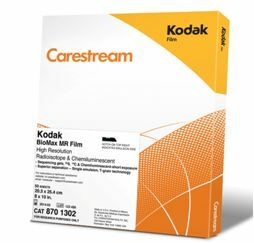 Carestream is for TEM films the successor company of Kodak. The films are made in the same buildings, using the same processes and materials. Coated on a sheet film .007" polyester base. Dimensionally stable and low‐outgassing. Fine grain, blue sensitivity, slow speed emulsion. Use safelight filters No. 1A, OA or OC and Kodak Developer D‐19. The SO‐163 film is twice as fast as 4489 and this makes the SO‐163 slightly grainier and with less contrast. Most biologists prefer 4489 and material scientists prefer the SO‐163. Internal packing is 5 x 50 sheets. Recommend to store frozen, which slows film's aging to insignificance; therefore the expiry date is of no concern. Leave frozen film to warm overnight before opening. Note: Film use, with the common use of digital TEM cameras has dropped. 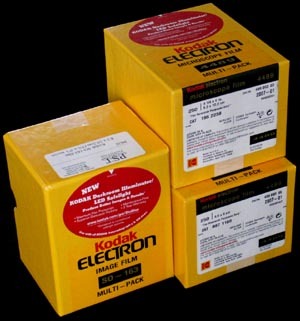 We buy these films on indent only and delivery will be 2 weeks. Kodak Scientific Imaging Systems manufactures nuclear track material, type NTB, for use in the detection of radio labelled samples in techniques such as in‐situ hybridisation. facilitate microscopic examination of individual silver grains in the developed emulsion layer. confirm the passage of ionising radiation. NTB has a high silver‐to‐gelatin ratio of very fine, uniform silver grains (which results in high resolution), and a very low level of background fog. In 2004 NTB Liquid Emulsion became the replacement for both NTB‐2 and NTB‐3 emulsion products. The NTB emulsion can be used for the lower as well as the higher energy isotopes. The only difference between the new NTB emulsion and the NTB‐2 emulsion is that the undeveloped silver grain size in the NTB emulsion is .40 micrometers, whereas the undeveloped silver grain size in the NTB‐2 emulsion is .26 micrometers, thus making the new NTB emulsion grain size slightly larger. Procedures used in processing and developing slides, and requirements for the darkroom remain the same. Because of the size of the undeveloped silver grain, the NTB emulsion is slightly more sensitive. 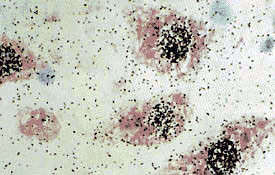 Many factors influence the performance of emulsion and/or technique used. These include: the isotope used, characteristics of the labelled compound, nature of the specimen and the kind of results desired.